During May, June and July, are you like us racing to keep weeds from setting seed? We manage over 100 prairie plantings and dozens of remnant habitats to cover annually. We try to cover all areas of the preserve as many times as needed. But we have our problem areas, areas that are low in diversity and high in invasives. How much time do we spend on degraded areas at the detriment of other areas? We all have limited resources. One tool we have learned to use is this 30hp Kubota tractor with a 50 gallon Kings sprayer with Boominator brand spray tips. This unit can turn problem areas into manageable situations. One tip sprays left, one right, and one both all directions. We like not having booms on the sprayer as we negotiate around and through brushy areas. A downside is that these units use more herbicide per acre. 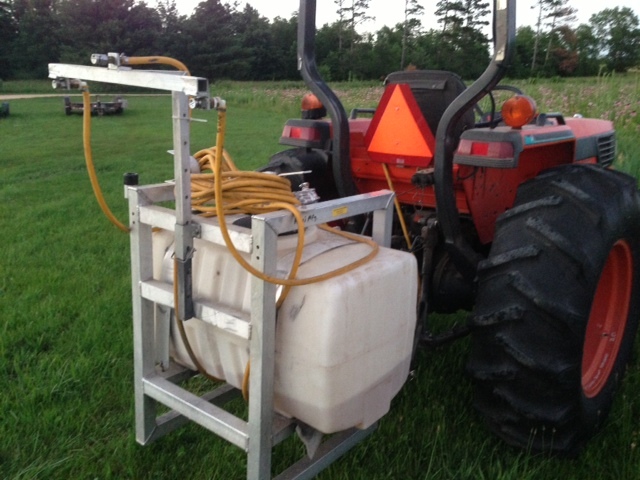 We also have a 150 gallon boom sprayer. A few areas we “boom” with broadleaf herbicide (Crossbow 2% or Milestone at 0.9 oz/gallon) have birdsfoot trefoil infestations. If the area is not a remnant, but essentially a fallow field, with a difficult legume infestation, then booming it might be a strategy for your success and sanity. We often boom edges of plantings that are weedy. We boom former pine plantations that came back as invasives. We boom spray CRP fields that are brome grass, invasive Lespedeza, and invasive shrubs. We boom prairie plantings that did not turn out more than a few native species. With judicious use of broadleaf herbicide we can turn such areas into low maintenance grass-only-lands. By applying our limited resources to managing remnants and caring for good habitat restorations we find we can have a sustainable weed management program. Thank you, Bill. It is very helpful to have you provide this kind of information. Here in DeKalb County Forest Preserves, we have smaller units and some different habitats (not much remnant) and sometimes it can be difficult to decide if we should just blast the weeds with our boom sprayer or spend time fighting weeds other, more time consuming ways. The last few years we have leaned toward less backbreaking work and used the boom sprayer more often. It is very helpful that someone who manages such a large complex of various habitats is dealing with similar issues and is sharing your observations and experiences. Great blog, keep it up. Thanks again.